Alex J. Cavanaugh: Just the Facts, Ma'am! I saw the sign for In Time and said that looked like Justin Timberlake. And yes it was Justin Timberlake. He's now a lead actor. My son said he's seen the thriller and it is about time as currency. Sounds interesting. You have a lot of news. Will check out A-Z blog and I am curious about that rule of three, I can't imagine what is it about, sounds like a riddle. Lots of news Alex,have already joined Arlee's A to Z site. Where to start?!?! Where to start?!?! Too many choices, mind exploding, am able to only handle one thing at a time. I'm old! Your bit over at JC Martin's isn't up yet, so will check that later!! Yay!!! Hell, I want to see that Chewbacca movie. Thanks for the shout out Alex. That's very sweet. Lots of great news. Regarding that Chewie pic ... WHY??? Lol. Thanks for the shout out for The Noughties Blogspot and thanks for signing up. Oceangirl, that was indeed Timerlake. Kitty, hopefully it's up soon. Dave, hope you get a good turnout. Oh Chewie, you were much more loveable before. Don't buckle to Hollywood pressures, stay true to who you are! Monday is busy! I better get started. Thanks for all the news and the creepy picture. I'm glad someone was organized this morning. That's a lot of stuff going on in the blog world. Great news! I love the Chewy mash ups. Thanks for the news updates. And I think GL got a bit of a bad rap. I enjoyed it too. Hi Alex - thanks so much for the shout out... and also for all the tips of what's going on - I must have a hop around! Alex, you are so full of, uh, news today. I learned a lot. Love the poster. I'm still exhausted from the A-Z Challenge. I liked the Green Lantern better than Captain America actually. ;) My review of it is coming soon. Insidious was good, but nowhere nearly as great as I expected it to be. That Chewbacca poster kinda creeped me out a little. LOL. Prep work for A to Z is beginning again? Whoa...where does the time go??? Bahahaha Captain Chewbacca was hysterical! Holy cow Alex this post was filled with fun!!! I'm most intrigued by Susan's new book so I'm headed over to check it out! Wow, lots of news. Mines not great news, but I am hosting my first giveaway at Laugh Quotes - $20 amazon gift card. Stop by if you get a chance. Saw Paul on DVD recently and enjoyed it. Other than that, it's black and white scary movies. Boogie boogie and thanks for the well wishes. Wow, so much going on! Hopping over to your interview now. Wow - news, news, and more news! And yes, definitely creeped out! Thanks for all the news and links! Man...you've filled my brain with wonderful news and that scary Captain Chewbacca image. How will I every erase that outta my brain and sleep tonight??? Heeehehhe!!! I just returned home from a 'workcation' at my Mom's in Brownsville TX. Hubs and I did manage one movie on the trip. "The Big Year", was a good movie (not great). It was filled with humor and some heartfelt moments but the fact that I have a bird obsession (among many others) truly made the movie for me. I'm just twisted that way! Heather, I've been working on this for a week! Rusty, it was a pure comic book movie. I liked it! George, I liked them both, but really don't know why Green Lantern got such a bad rap. Lynn, watch it - fun movie! Jen, someone had fun making that poster. Rhonda, sorry I didn't know about it sooner! Hey Marvin! Good to hear from you. Wow. I have no idea how anyone keeps up with you. Hilarious pic. I'm off to read your interview. This was a fun post. I'm out to discover what all the fun links involve. Thanks for sharing. I'm already signed up on the A to Z blog. Love the Chewy pic. That silly movie made me into a major Green Lantern fan. I don't know if my pocket book can handle any more comic books, but if it's got Hal, Kyle, Guy and John, I'm there. Out of all the comic book movies I saw this summer, GREEN LANTERN was actually my least favorite (although I did enjoy it). And don't get me started on Hollywood Horror movies and bad endings!!!! Captain chewbacca kind of creeped me out! Hahahaha. Love that picture of Captain Chewbacca! Still haven't seen Green Lantern, but it's in the Netflix queue. Great to catch up with you, Alex! Insidious was good for about 30mins then all downhill. The noughties blogfest sounds fun, heading over to sign up. That picture of chewy is hilarious. Wow...you are indeed the super blogger keeping track of all of those blogfests. I think it's funny that the ninja captain read a romance novel. You will forever be a ninja that wears pink. Oooh, lots of good links. Thanks! Um, that Chewbacca picture is freaking fantastic! That particular Chewy mash-up is a bit freaky. I love the blue velvet dress in Anne Gallagher's book cover. Off to check out your interview! no words today... just chewie. & i like the "noughties" is that a real word? Rena, welcome to Green Lantern fandom! Ricky, I hung with it until the very end. Then the movie fell off the cliff. Michael, not a chance!!! And Anne is one of my critique partners. After reading her excerpt, I feel lucky to have her. Sorry, the interview is not up yet! Hopefully soon. Oh Lord, Alex. So many blogs and so little time! Lots of stuff happening! I've been tempted to get Green Lantern. Can't hardly wait to get my Kindle so I can read Anne's book and have signed up for The Challenge. Good morning Alex-- Thanks for the informative post! I'm glad you're on top of things this Monday morning. 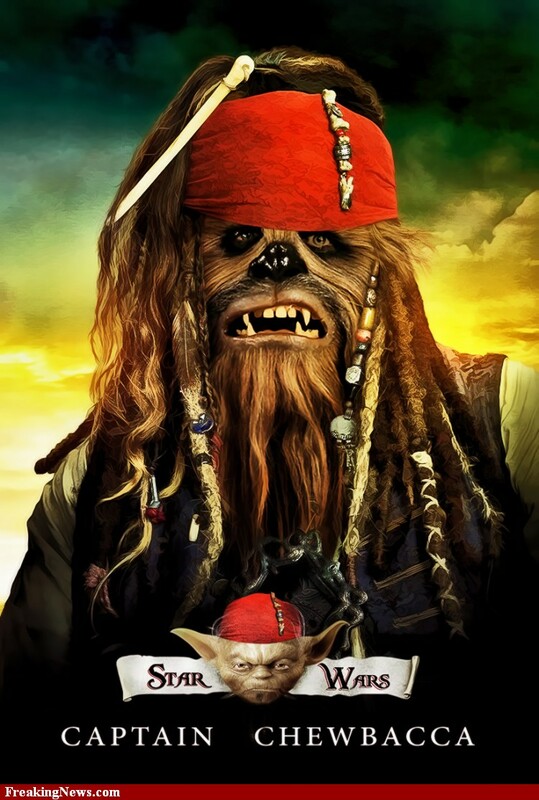 I actually would prefer to see Chewbaca as Captain Jack. I was so relieved when Kiera and Orlando bowed out of the last film. However, they just replaced them with a shirtless missionary and a doe-eyed mermaid. Figures. Yet another love triangle. Alex, didn't see your piece on JC Martin's site ... reader, writer and fighter that he is. I feel like reading your blog this morning was like the Monday update of the blogosphere (with a side helping of Chewie)! Thanks for all the great info and links. Yes, that image creeps me out. Wow, there sure is a lot of stuff going on. Thanks for updating us. there were a few in there I missed. Creep me out? What could be better than Chewbacca and Captain Jack all in one? For some reason, that Chewbacca isn't nearly as creepy as the other one. Lighting? Color? I can't quite put my finger on it. I watched Red State on the weekend. Amusing, but not as shocking as I expected. At least The Walking Dead made up for it last night! That Chewbacca picture is definitely not as freaky as the other one. I actually kind of like this one. The Noughties Blogfest sounds like fun. But I can't believe we're getting ready for another A to Z Challenge already!! Thanks for sharing all the news I didn't know about. Whoa, I've got whiplash from jerking about back and forth from all those bits of news! I'll have to check out a few of those blogfests. Thanks for the update, Alex! A lot of news for a Monday. Could not find your interview over at JC Martin's site. MsMariah, I was glad those two weren't in it as well! Maybe in the next one the Wookie gets the mermaid. Christopher, sorry - don't know what happened! Pat, you should join us! MJ, I think Lee is just preparing way in advance this time. Edi, it's not up - not sure what happened. I think Chewie looks cute as a pirate! The Noughties blogfest sounds awesome! And Chewy rocks the dreds. Reading that romance novel has now spoiled you for HEAs, hence the dislike of bad horror movie endings. I love me an HEA. Thanks for all the neat links! Wow! Lots of amazing reads!!! Checked out Anne's site. You weren't kidding! Lots going on in bloggyland. It's good to see. Thanks for all the news. Green Lantern was pretty good. I think we watched that last weekend ... now that I'm not working weekends any more. Saw XMen First Class this weekend. That was pretty good, too. Lots of good stuff going on. I must do the A-Z challange this year. Chewy as Jack Sparrow could work lol. Kelly, you always make me smile! Julie, now who really wants a crappy ending anyway? Mary, they were both great! Alex, the next one we plan to see is In Time. Alex, how in the world do you carve out time to do all these blogfests? My mind bloggles, I mean boggles at the thought of the work involved. I'll admit it, I'm a wimp. No way, no how can I do that many blogfests. I did enjoy the news. I'll have to check out Anne's book. That last picture is Epic lol. Hi Alex, I've nominated your blog for an award, for all the effort you put in to get bloggers connected. Check out my blog and pass it on! Sia, that's why I'm a Ninja. And my guest post is now up!!!!!!! That image is truly awesome. Love it. Thanks too for all the cool news. Well ... that Blogfest from A to Z appeals to me, I participated in April dedicating every letter to a dead poet. I'll leave thinking like I will focus in 2012. But Chewbacca used to be such a cute little guy. So much going on. Thanks for all the news, Alex. So much news - off to check out the links! Ha! That pic is hilarious... and creepy. Thanks for all the great links! Have seen no movies... still sucked into Lost on DVD... in the fourth season now ... must. watch. more. Thanks for the shout out Alex. That chewbacca poster really cracked me up. More so for the little Yoda than for the main image. Leovi, hope you do it again! I believe that's how I found your blog as well. Melissa, Yoda would look way creepy. Movies, yes! I saw Three Musketeers and Real Steel this weekend and loved them both. LOL, you always distract me with links I just can't resist. Thanks for the screwy-looking chewy. ha ha, Captain Chewbacca, I absoloutly love it! Lots of news. I am looking for a cabinet... if I can afford one. I'll go take a look at your friend's site. That image didn't creep me out. I actually thought it was funny. As for good movies. I finally watched A Painted Veil. I've been thinking about it for two days. It really got under my skin. Great movie. Sorry for the weird post over at my blog. Yes, that certainly is something to blush over. Life has been so crazy for me that I'm starting to forget lots of stuff to the point that I'm finding it disturbing. Me thinks that I need a break? Aaaack! Will be catching your interview on Li's blog. Wow, that is a hell of a lot of news! I'm glad you enjoyed Green Lantern, I thought I was the only one who thought it wasn't as terrible as everyone said it was. Love Chewy's Pirates look . . I gotta say though, I'd not want to be a judge in this blogfest; there are so many awesome writers who have joined. I am also excited about Anne's book release. I haven't seen any movies lately - good or bad. Too busy with my nose in one writing event or another. Lots of updates today! I can't wait to see your interview! Ninja reading Regency romance, hehe, you need to change the poster/avator now. just popping back to let you know I took your comment about the criteria for gold award making it a bit limiting and have changed it Alex. Thanks for your input, on looking at it again, I agreed with you entirely. Dempsey, everyone wanted more Chewbacca! Elizabeth, I'll check it out again today. Jamie, I really dug it! Donna, maybe you will win then! Dempsey, thank you! I'd planned to nominate George's site - glad I still can!!! Lots of great info here and I love the poster. Thanks for all the info. I plan on doing the A to Z challenge so I hopped over there--The Captain Chewbacca poster--well--not sure! That IS a lot of news - thanks for the update! Thank you for sharing about The A Through Z Challenge Alex! I'm looking forward to participating in April, it sounds like it went great last year! You and my brother would get along really well. He LOVES DC comics, and has seen every super hero movie known to man. Thanks for sharing all these links! I'm so thrilled for Anne and love her new site. That image does freak me out. No, Chewie, no. You're supposed to be loveable and cuddly and growly! Ha. Thanks for all the great news and links, though! Great news all around. I wrote about insecurities today on my blog, but might have more to say on the topic next week. Time flies, doens't it? Chewbacca is abnormally photogenic, IMO. Like the little logo of Yoda, too. Hubby loves any Comic Book Hero, so we usually go to all the films featuring them. We'll probably see Green Lantern soon. Lindi and Amy, glad you're on board for the Challenge! Angela, your brother is a cool dude. Laila, I'm jaded when it comes to scary movies - I've seen it all. Don't let the romance stuff fool you - I'm still a tough Ninja! Charissa, if you like the comic book, you'll enjoy the movie. Reynolds nailed the role. Mary, that is next week! Tyrean, glad you saw it. I can do without sticky floors though. DG, you'll find it's a blast. Oh. My. Gawd. Captain Chewbacca?! Priceless. Being the ninja master, I thought you would like to know so that you could see for yourself. Micahel, Ali is no rogue! She is awesome. We're already talking about A to Z -- just shows the power of a great idea. I'm in, and I already popped over to follow the new site. I signed up for the Internet Book Fair, but gosh darn so busy with everything it slipped my mind. D-oh! I'd better skeedaddle over there and see what I'm missing. Thanks for the reminder! Thanks for another Chewy pict, but they're all a bit disturbing! Hey, thanks also for the congrats! Stephen, you need an iPad to send you reminders. Lydia, really happy for you! I didn't know that you and Anne were critique partners. That's awesome! Wow. Love the picture. It looks to me as if Chewbacca is ready to put Johnny Depp to the test. Julie, she is really, really good! Michelle, it was good - I admit it. Tons of great news! Thanks for posting all these fabulous links. Wow. No kidding that's a lot of news. Thanks for the update. You've always got SO much great stuff to share. That picture of Chewy is hilarious! Glad everyone dug the picture! Thanks for the mention of the new A to Z site. I'm still here in Tennessee with limited access time for the computer. Having fun, but missing my ability to spend more time leaving comments on blogs. Arlee's done some great work with this blog. It's great to see it spinning the challenge to a full blog! Should just keep getting better.